There are a few different varieties of the Uni Alpha Gel mechanical pencil – originals, slimlines, shakers, etc. I never planned on getting one because they aren’t available in my part of the world and their main feature is a large squishy gel grip…something I am not usually enamoured with. But in a very polite way Isu from Japan frequently asked me if I had a Uni Alpha Gel, and did I know “...its gel grip is the exact same consistency as Haribo Gummi Bears?” Well, I hadn’t ever heard of Haribo Gummi Bears, obviously another thing we don’t have down my way, but Isu’s sweet tooth got to me and eventually I ordered an Alpha Gel mechanical pencil. 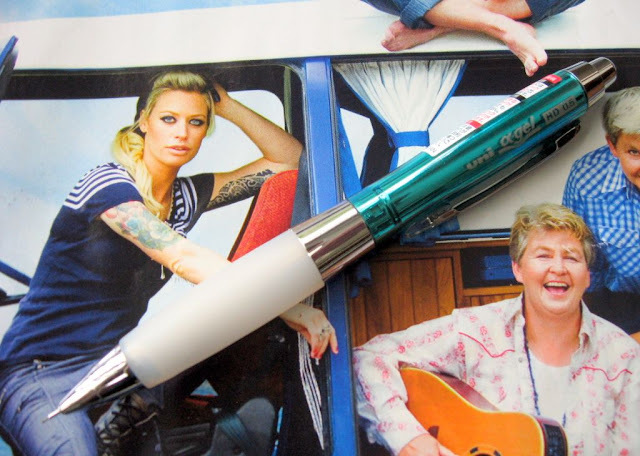 A Uni Alpha Gel HD Shaka Shaka M5-618GG 1P chrome green mechanical pencil to be precise. The bright shiny chrome green upper body and metallic chrome fittings combine to make a rather striking and attractive looking pencil. The Alpha Gel weighs in at 18grams and in the hand it feels about the weight you would expect for a largish plastic mechanical pencil. I must say that when you first pick it up or wave it around a bit in your hand the movement of the internal shaker weight seems more obvious than on many other shakers, and more noisy when the weight hits the end stops. I have read that the gel grips are slightly different formulations and consistencies on some of the models. 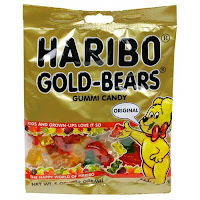 (Unlike Gummi Bears?) My creamy white grip is quite soft and squishy, flowing and moulding under normal finger pressure. I wouldn’t be surprised if the grip has some ‘memory’ and becomes permanently deformed after extended use, but I haven’t used it long enough to say for sure. I have also read on some other reviews that people have had problems with the grip tearing. It didn’t happen to me, but I take extra care with my review pencils because I want to try and keep them in ‘as new’ condition for my collection. I could see the Alpha Gel grip being very susceptible to damage if stored in a pencil case and rolling around with other pencils and items. That’s just plain ole askin’ for trouble. Anyway, it does seem likely to me that the Alpha Gel grip is not particularly robust or durable. I’d also suspect that the grip won’t stay that nice milky white colour for too long in real-world conditions. Like most gel grips it is of larger than average diameter – about 13mm or 1/2inch to be a little more specific. Not surprisingly the Shaka Shaka is a shaker mechanism pencil. The instructions for its use were a little beyond me, but you can operate it as an ordinary push top ratchet mechanism, with ten clicks getting you 7mm of 0.5mm lead, or you can shake away and operate it with the shaker mechanism. The push top button can also be fully depressed to lock the shaker mechanism so it doesn’t operate. This doesn’t just lock the shaker, it also makes the pencil non-operational as the lead is no longer held by the chuck and thus can be pushed back up inside the sleeve. Some might say that the lock is not 100% effective, as if you give it a really good shaking you will get a little bit of lead advancement. However the lead is not gripped and it can just be pushed straight back in. The shaker is readily activated, possibly almost too easily, but that’s a matter of subjective opinion. I have long since reconciled myself to the fact that if you write a blog, at some stage you are going to end up looking stupid, only the frequency and degree of stupidity will vary, so now for the embarrassing bit. I feel really certain that when I first got my Alpha Gel that the lead sleeve was retracted, and the first push on the top button extended the sleeve out. Now though it is a non-retractable fixed sleeve. So surely it can’t have been retracted when I first got it? But my mind is convinced. Garrrr!! !….I must be going mad. However I will ignore the madness and say that the Uni Alpha Gel has a fixed non-retractable 3mm lead sleeve. There is a small white occasional use only eraser under the top button. I quite like the pepper-pot arrangement of holes in the top button. As expected you pull the eraser out to refill the lead magazine. The pocket clip is very good - very springy with an interesting clear plastic tip that catches the barrel colour or not, depending on your angle of view. 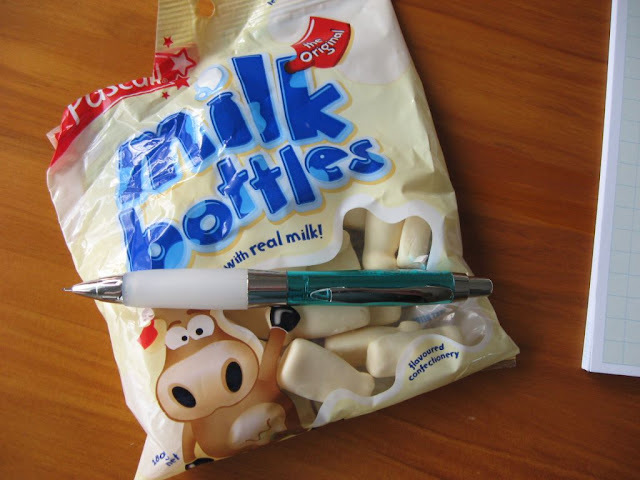 Whilst I wouldn’t say no to a Gummi Bear or Jelly Baby, I’m really more of a Milk Bottles type of person. Many Milk Bottles perished preparing this article. • Best Points – That chrome green finish really is good looking. 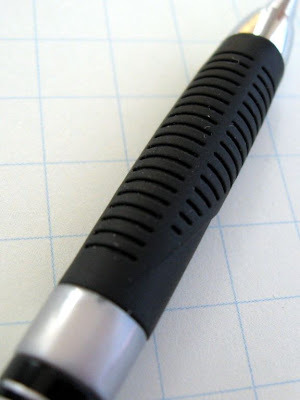 • Not So Good Points – Lead sleeve not retractable, questionable durability. Dimensions – Length 145mm, diameter 13mm at grip. Balance point about 70mm up from the tip. Note: The alpha symbol is sometimes mistaken and written as oxy and thus the pencil mistakenly called oxy-gel, uni oxy gel or oxi gel or other names along those lines. A different concept for a yard of lead? From 'Popular Mechanics' magazine, March 1950. (c) You thus have unsupervised access to (i) online pencil shopping and (ii) beer, so...what could possibly go wrong? Garrrrr!!!!!! My entire annual Pencil Budget has now been spent. I will have to start selling things or get a second job to earn pencil-money, or go cold-turkey for the rest of the year. ...luring me to wreck and ruin on the shores of That Internet Auction Place That Must Not Be Mentioned. With my beer goggles on and tuned to maximum enhancement, I was a lamb to the slaughter. The Mechanica, now that’s a powerful name for a mighty instrument of design. There’s no messing with this pencil. ...you twist the metal grip to retract the sleeve and reveal the full glory. Many would say a true classic. Great styling, lead hardness indicator, visually appealing grip zone, push top mechanism, removable pocket-clip, no eraser. 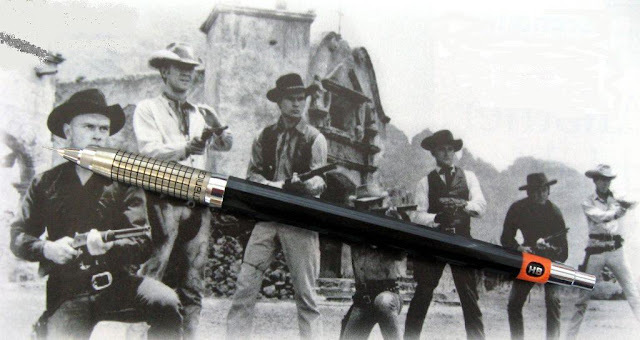 Timeless through the ages, a pencil for then and now. Glad to have one…for sure. Interesting design with that extending protective sleeve…definitely. Worth what it cost me, money well spent…ahhh…now there’s the rub. Lately I've been spending heaps of time on behind the scenes blog housekeeping stuff e.g. transfering all my DMP Organiser blog content back to this blog, and on projects like the Top 10 lists. Just some information for any of you who use Firefox and have trouble commenting on Blogger blogs like this one, one common cause is that you are not allowing third-party cookies, so if you change your security setting to allow third-party cookies then you will probably be able to comment on blogs. The link has been in the sidebar for a while, and I think the site is still under construction, but whats currently up is mighty impressive. 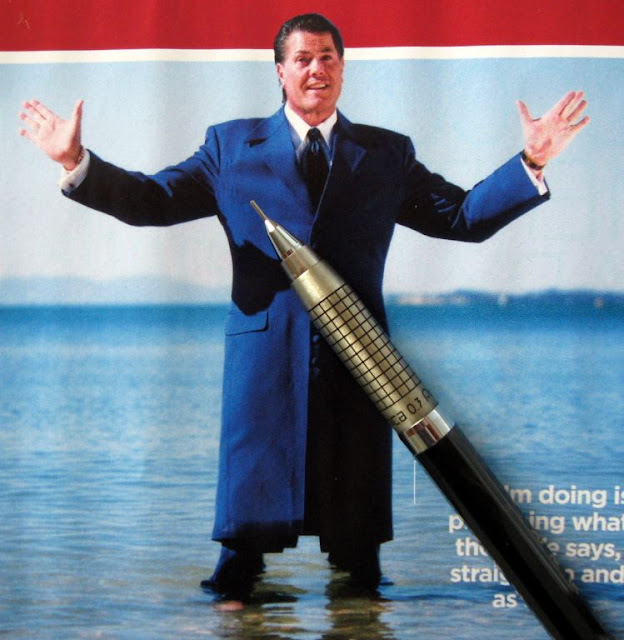 Check the Eversharp section of Online Pencil Museum. I am filled with awe and tinged with envy. The Monami Gripix mechanical pencil appears to be part of a small ‘Gripix’ range of products sold by the Korean stationery company Monami. 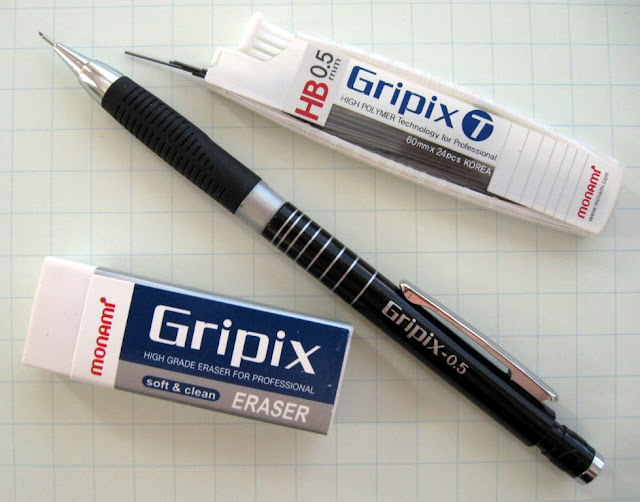 There is the 0.5mm Gripix mechanical pencil, Gripix-T lead refills and a Gripix eraser. Both the eraser and lead refills include the wording “…for professional” on them so I assume Monami market the Gripix products as superior grade products. Over the last six months or so I’ve ended up with quite a few mechanical pencils from various Korean brands. 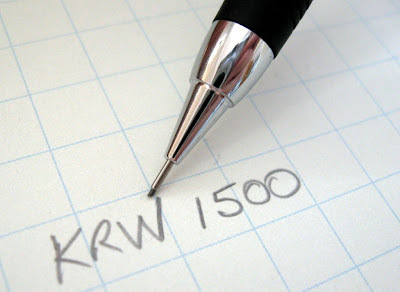 Korean people have generally implied to me that most Korean made writing instruments tend to be cheap both in price and quality, and their attempts at more expensive looking pencils are not good. This has always surprised me as many Korean manufacturing industries don’t operate in the cheap or nasty end of the market. But I did say “most”, not “all”. There are some Korean brand mechanical pencils that are not down there in the mire, and an initial glance at the Monami Gripix pencil suggested it might be one of them. Firstly, it didn’t look cheap from a distance, and a second closer glance didn’t reveal any glaring issues either. That’s better than many Korean pencils have done. 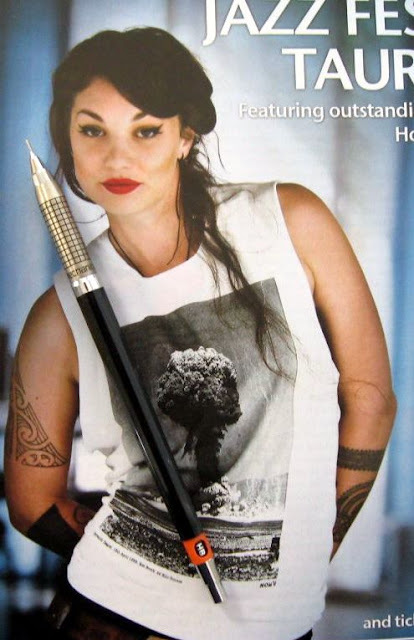 So then, the Monami Gripix mechanical pencil is a drafting or technical style pencil. In the black and silver plus chrome colour scheme of my example it looks quite good. Close inspection though reveals the printing on the pencil body is not of a high standard – the silver rings do not completely encircle the body, and there are some dots of silver splattered on the body. The chrome appointments though look good, and the body and rubber grip appear to be well moulded. The Gripix is quite lightweight, only 10g, and it certainly doesn’t feel any more substantial in the hand. The round rubber grip is quite a narrow diameter, with moulded in grooves which give a little under finger pressure. Combined with a reasonably grippy compound this is a rubber grip that works well, one that actually improves grip. Although the grip is round the groove pattern is not constant and a smooth area aligns with the fixed pocket clip perhaps discouraging those who like to twirl their grip. 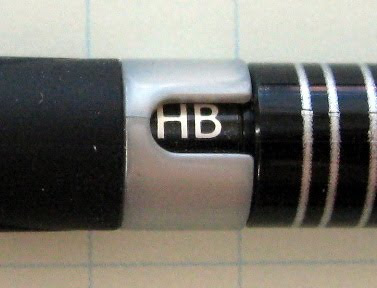 The lead sleeve is the traditional draughting pencil fixed non-retractable thin lead pipe, this time at about 3.5mm long. The lead advance mechanism is a standard push top ratchet. 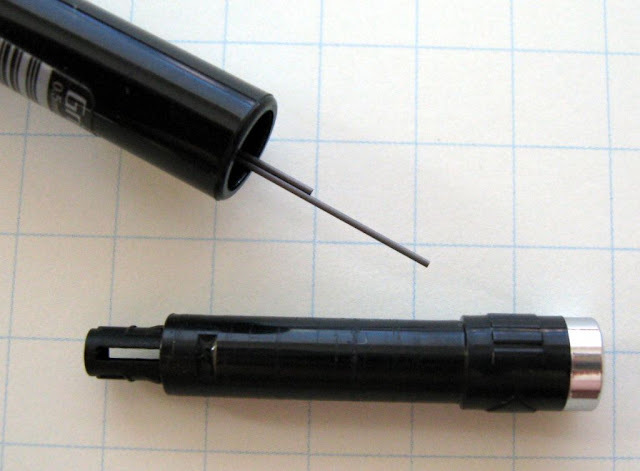 It’s a fairly positive feeling mechanism; ten clicks will get you 7mm of the 0.5mm lead. At the time of writing Monami only offer the Gripix mechanical pencil in 0.5mm lead size. I did an unusual thing (for me) and unscrewed the tip section to have a look at the mechanism and chuck. It is an all metal chuck for those who demand that. Just above the rubber grip is a lead hardness indicator. It is a simple rotating ring with a U-shaped cut-out to display the lead grade printed on the body underneath. Grades 2B, B, HB and H are available for display. Not a particularly large selection, and perhaps geared more towards art and general writing rather than drafting work. There is no positive lock on the ring, it just sits in position by friction. 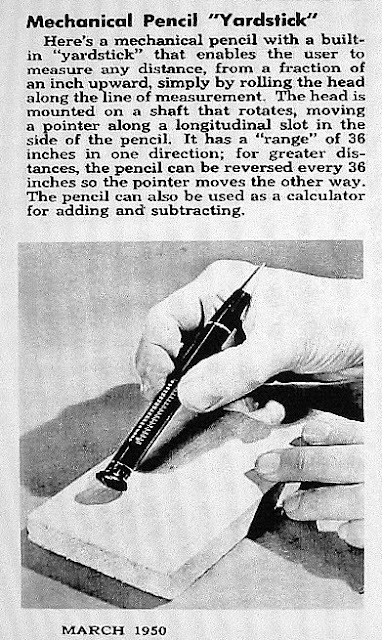 It is prone to being inadvertently rotated as you handle the pencil. Also the plastic ring is a moulded metallic silver colour and it just looks plain cheap. I think it is the single most obvious feature that detracts from the Gripix. The pocket clip looks quite good, but is only barely adequate. It doesn’t spring well. ‘MONAMI’ is stamped into the pocket clip. Up at the top end of the pencil there is a twist out eraser cartridge. 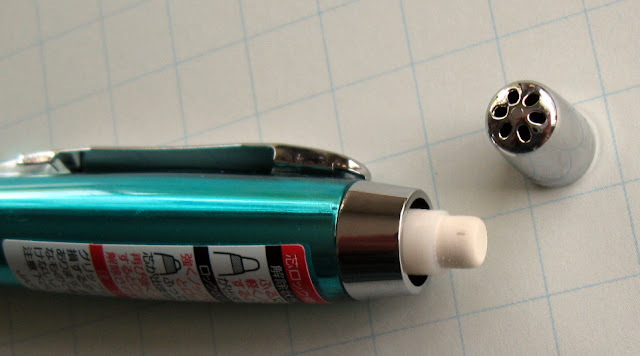 The eraser is about 3.6mm diameter and has 22mm of usable length. The twist function works well, but the small chrome ring around the top of the cartridge is loose. It spins on the black plastic cartridge. That’s no big deal, it is purely decorative, but again it just seems “not right”. I feel it should be fixed, not free to spin, and I keep expecting it to fall off. A more important point is that the eraser always has some black powder on it. 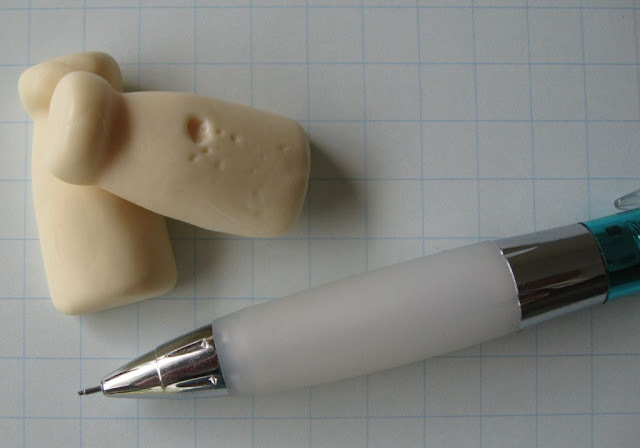 Nice white eraser, clumps of black powder…again it just looks wrong. I’m not sure if the powder is graphite dust or plastic grindings, but no matter how many times I wipe the eraser clean, next time I twist it out the black stuff is back. I’ll be honest and say that from the feel of the eraser compound I had my doubts as to whether it would be any good, but I gave it a quick try and it did a respectable job of erasing HB mechanical pencil lead. You pull the whole eraser cartridge out of the body to refill the lead chamber, which is a decent size so you’ll get a good number of spare leads in there. ‘Gripix – 0.5’ is printed on the body. The barcode and price sticker states KOREA which I want to believe means “Made in Korea”, but that may not be the case at all. Somebody from Korea want to enlighten me - does stamping ‘Korea’ on an item mean ‘Made in Korea’, or just that it’s got some association with Korea, like designed in Korea but it could be made in China? Overall then, despite the mainly aesthetic faults detailed above, I quite liked this pencil, and for the peanuts that it costs, the Monami Gripix mechanical pencil is a pretty good deal. • Best Points – The rubber grip (Have I gone crazy?). • Not So Good Points – The lead hardness ring design and appearance really lets the side down. Dimensions – Length 145mm, diameter 10mm at widest part of grip. Balance point about 70mm up from the tip. Coming soon to a blog near you…more on Gripix eraser and leads. A lot of people visit this blog and contact me looking for recommendations for a mechanical pencil for general everyday writing and office type use, and I wanted to create a list of pencils for them to consider. The idea was to create a list, a Top 10 or something similar so they could just go straight there for a list of candidates to consider. I already have My Top 5 but that’s not quite the same sort of thing, so I decided to go down the same sort of path as the Top 10 Drafting Pencils and create a list with input from a wide variety of fellow mechanical pencil users. So, up above you will now see Top 10 General Mechanical Pencils page. That page also explains a little about how the Top 10 were decided. I was a little surprised at the number of drafting or technical style pencils nominated by people, but I guess it shows that many drafting pencils are perfectly suitable as everyday writing pencils. I also note a general lack of ‘pocket-safety’. While there were a great variety of pencils nominated for the Top 10, there was also a small common core. Pentel Sharp P200 was by far and away the most commonly nominated, and Pentel Sharp Kerry wasn’t far behind. Both of these were also way ahead in the final round voting. I would like to thank all of you who participated in the creation of the Top 10, this is the first time that any of you have seen the final results. Somewhat surprisingly the whole thing was much easier than I expected, and I didn’t even have to muck around with the votes too much to ensure the correct result…now that’s a good election! Some readers may well be thinking, “Hey, I wonder why he didn’t ask me?” Umm, I wish I knew why too, but other than plain old stupidity and forgetfulness (beer) I have no excuse for the glaring omission of not asking you. Half way through the process I started thinking, “Hey, XYZ hasn’t replied yet…oooops… I didn’t invite them” but by then it was sort of too late, so I can only extend my sincere belated apologies. Feel free comment here on the Top 10. Thanks to those of you who voted. Just like in previous polls I get the feeling that Japanese people don’t vote. The 9 readers just does not tally with the direct views from Japan whenever I post a new article. Japan is also the only place to show a decline in readership. As always I am very interested to hear from any and all readers and learn a little about the pencils of their part of the world, but at the risking of being accused of favouritism I would like to say a special Hello to the lone solitary person from Africa. Love to hear from you, my contact details are on my blogger profile. Also, I would be very interested to hear from any of you who are in Turkey, Other Central/South America (please don’t be offended Brazil) and of course good old Elsewhere. I am rather surprised at the number of you Elsewherers. It would be good to know where you are from – either by contacting me or leaving a comment on this post. As you might expect, about 250 (50%) votes were recorded within the first 3 days of the poll, and then things became a fairly constant progression of about 20 – 25 votes (5%) per day for the next 10 days that the poll was open. This was still the case on the last day so there are obviously a fair number of regular but not so frequent readers. 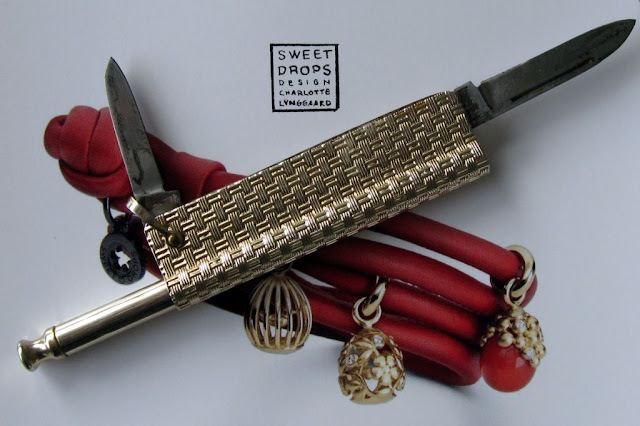 This was auctioned as a ladies pocket knife with mechanical pencil. The jewellery case appears to be original and has a label "Styled by Fifth Avenue" pasted over the top of the original printing on the satin lining. 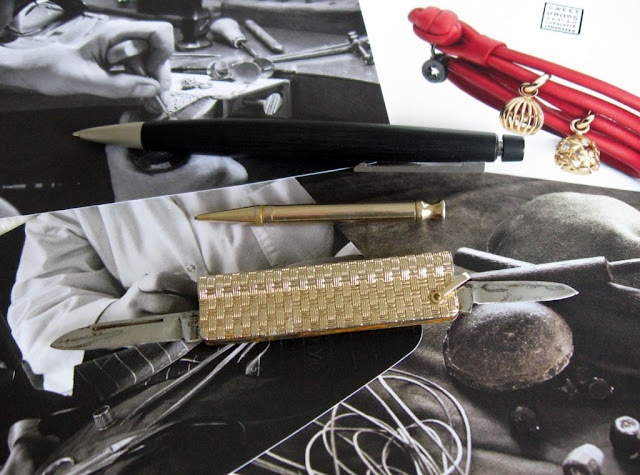 A short thin screw action tip feed 0.9mm lead mechanical pencil fits into the knife body as shown. In the picture above thats a Lamy 2000 for size comparison – it's twice as long. "Imperial Prov RI" and two patent numbers are stamped into base of the knife blades. Both of the patents were issued to Imperial Knife Co. of Providence, Rhode Island, the first in August 1939 and the second in June 1942, so we know it was manufactured after mid-1942. Wikipedia and other web sources tell me that in 1985 Imperial changed it's name to Imperial Schrade, and the Providence RI factory was closed in 1988. Anyway, these dates combined with the use on 0.9mm lead and it's general appearance make me think this penknife-pencil most likely dates from the 1950's to 1970's. Despite being auctioned as a ladies item, the double blades make think it was most likely intended for a gentleman...but then I don't really know much of what ladies carried in the 1950's and 1960's...any of you readers care to comment? The events of 9/11 and subsequent restrictions on travelling with pocket knives badly effected Imperial Schrade and they went bankrupt in 2004. A correspondent from Japan finished a recent email to me with an almost casual “Pentel P205 (It has not been sold any longer in Japan)”. 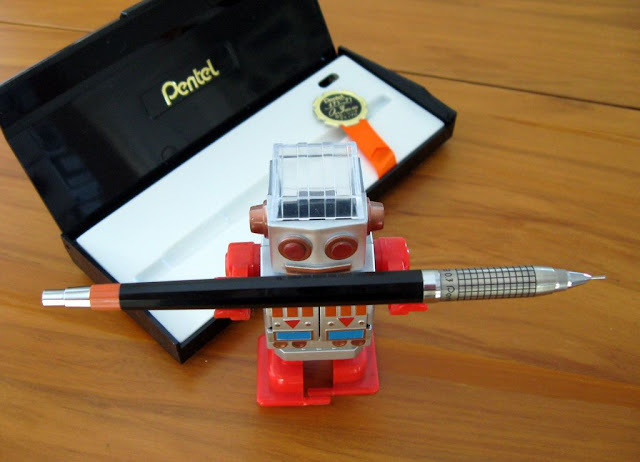 I rushed to the Pentel Japan website…and…the P200 Sharp was no where to be found. Apparently this is years old news, but it’s new news to me! Have I been living in a cave under a rock for the last 5 years? I will just have to hope that sales continue to be reasonable in other parts of the world and Pentel will still manufacture the P205 for many years to come and sell it in other places, just not Japan. On the other hand, I think I’ll be buying a few fairly soon, just in case like. In the meantime, I might just have to hit the bottle to help get over the shock. Truly one for mechanical pencil nuts. A while ago Lee from the Lone Star State sent me these quick snaps of his Mr Planters Peanut mechanical pencil. 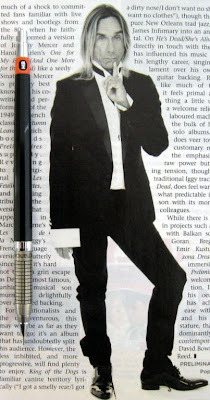 I had previously seen this pencil on “that auction site” but it’s good to see one in more detail. Lee doesn’t recall exactly when he got it, but he thinks it was in the late 1980s or early 90s. He purchased a bag of Planters peanuts out of a snack machine at work and saw the offer for the pencil on the back of the bag. Send in two bags and a small fee for shipping and handling and receive a Planters Peanut pencil in return, if he remembers correctly.